Preheat oven to 375°F. Butter an 8-inch springform pan. Line the bottom with parchment paper cut to fit. Butter the paper. Combine the chocolate and butter and melt over a saucepan of barely simmering water. Set aside for about 5 minutes to cool. In a small bowl, combine the egg yolks, dissolved coffee and vanilla extract and whisk just until blended. Pour the yolk mixture over the cooled chocolate and whisk until no streaks of egg are visible. Combine the egg whites and cream of tartar and beat with a mixer on medium until foamy and the cream of tarter dissolves, about 1 minute. Increase the speed to medium-high and continue beating until the whites form soft peaks, 2 to 3 minutes. Add the granulated sugar in 2 batches, beating for 15 seconds after each addition. Then beat for 1 minute more; the whites should be shiny and stiff. Using a rubber spatula, gently fold about one-third of the beaten egg whites into the chocolate mixture. Spoon the remaining whites on top and fold in until no white streaks remain. Pour the batter into the prepared pan and smooth the top. Bake until the cake puffs up, the top looks firm and the middle jiggles only very slightly when the pan is gently shaken, 19 to 23 minutes. Transfer to a wire rack and let cool in the pan for 30 minutes. The cake will sink slightly in the middle. Run a thin knife along the inside edge of the pan to loosen the cake, then release the sides and lift them off. Let the cake cool completely, about 1 hour more. Use a thin knife to loosen the cake from the pan bottom. Then, using 2 wide metal spatulas, slide the cake onto a serving plate. Have ready a tall glass filled with hot water and a large, sharp knife. Cut the cake into 8 wedges, dipping the knife in the water and wiping it clean before each cut. Use a wide metal spatula to transfer the wedges to individual plates. Makes one 8-inch cake; serves 8. 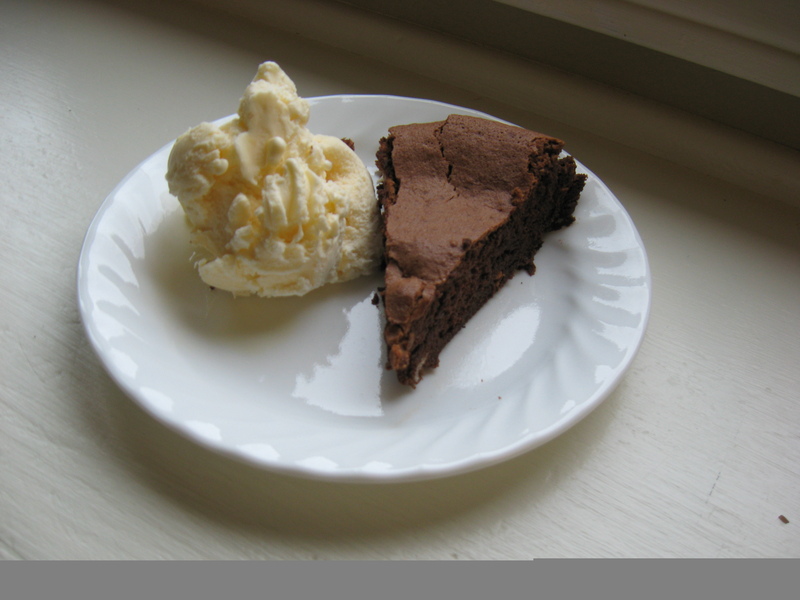 Pastry Chef’s Tip: Lightly sweetened whipped cream is the perfect foil for slices of dense chocolate cake such as this. Use the whip attachment of a mixer to beat together 1 cup cold heavy cream, 2 Tbs. confectioners’ sugar and 1 tsp. vanilla extract until soft peaks form.